Creating a box shape demo. Before I get into box shapes, I want to emphasize how seeing things as simple shapes allows you to more easily draw complex things, like your bird sculpture, for instance. If you can train your mind to simplify it into ellipses, spheres and cylinders, it becomes easier to not only draw it but paint it, as well. Once you get the overall shape correct, then you can change it and add details. That's what I want to teach you to do with box shapes. To train your eyes to see simple shapes and draw their proportions accurately, you need to combine observation with measuring. As you gain experience, your eyes will become better and better at visually estimating distances. In the beginning though, it is better to consistently measure to confirm you are seeing distances correctly. Measuring only takes a few moments and will effectively help train your eyes. 1. I start my drawing by deciding how wide the front of my chair will be on my paper (the arrow) and draw two vertical lines representing the nearest corner (short line) and the chair's right corner. Holding my pencil horizontally and at arms length, I visually measure the front of the chair and compare this distance to the left side of the chair. The side is about ¾ the distance of the front. On my drawing I measure a distance that is ¾ the width of the front (the arrow) and from the near corner, draw another line that will be the back left corner. 2. The start of my first box shape represents the box formed from the top of the seat cushion to the floor. Remember, you always start with the largest, simplest shapes first. 3. While all of this box shape doesn't show in reality, lightly drawing it helps train my eyes to see it and helps me as I proceed with the rest of the drawing. Especially if you want to draw from imagination, it is crucial that you start with the largest, simplest shapes first. You make sure everything is the right size, the right shape and in the right place before getting into the more complex details. 4. Even if the back of the chair is rounded, I want to simplify it initially. I draw it as another box shape, knowing I will change it when I finish the drawing. Having already drawn my first box shape helps me position the back. 5. I simplify the arm of the chair and draw it as a simple box shape as well. 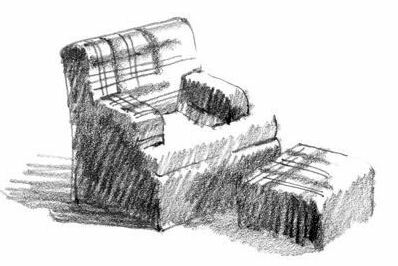 Again, because I've lightly drawn the two previous box shapes, they help me draw and position the arm of the chair. 6. I finish the basic drawing of the chair by completing the other arm of the chair. At this point I look over my drawing to make sure I'm satisfied that my proportions are correct and everything is where I want it. If I am satisfied, I can erase any of the lightly drawn guidelines that I don't need or don't want to show in the final drawing. Now, before I start my final drawing or painting, I need to ask myself: how am I going to make this fun to do and interesting to look at? How am I going to make it more than just a depiction of a chair? One thing I decide to do is to add a footstool. (I could add as many more things as I want.) I also decide to not show everything in the drawing, to leave a few areas incomplete. This adds a little visual surprise and lets viewers use their imagination, too. To complete the drawing, I also use the guide in The Shapes of Things manual for how to show light and shadow on a box shape. Notice the incomplete areas are consistent with my lighting scheme. The incomplete areas tend to be where the lightest areas on my chair and footstool are. In drawing the TV stand you need to create the box shape in order to find the back of the stand. If the television screen is hiding it, you have to estimate where it is. Since the back corners of the stand aren't square, you need to know where the two side legs and the back leg are so you can draw the angled part of the top correctly. You need to estimate the width of the back leg and center it on the back edge of the box. Then you can draw the angles. Even if you are drawing the TV stand straight on or in one-point perspective, you still need at least the top of the box shape in order to draw the angles so they look right.